Archers are a Class of Unit (as in "archer-class infantry").. An archer uses projectile weapons, such as a bow and arrows or crossbow, as its weapon and has the Archery special. Warlords can also have the archery special. Notable examples include Captain Archer and Artemis. Any unit can, theoretically, throw or fire a projectile weapon. However, the archery specialization gives a unit a much better chance of hitting its target, while a non-archery proficient unit's chances of hitting the target are greatly reduced. Archer-type units have the ability to strike at flying units. Some units have a specialized variant of the archer special, excelling at a particular type of ranged weapon. Prince Albert Zamussels, for instance, specializes in throwing knives. Harpooner class infantry can throw their harpoons in addition to using them in hand to hand combat. Charlescomm has used caster links to invent entirely new types of archer specialization revolving around firearms, such as archer specialist, rifle. Other known archer specials include: longbow, crossbow. WoodsyTBFGK 57 and Shady Elves, as well as Marbits and Men, all have archers. While men and marbits have other unit types, it is possible (though unclear) that Woodsy and/or Shady Elves only have archer units, or that all such elves are automatically archers, in addition to or instead of, any other classification. It is likely, though not supported directly via the comic, that Shady and especially Woodsy elves are superior archers to all others. (As this is a common feature of such units in other games). The maximum range of Archers is unknown. It's probable that they can reach any unobstructed target within their hex. Shooting at other hex may come with a trade-off for movement. Ansom LIAB Text 9, orders his flying units, which are under archer fire, to land on the ground. 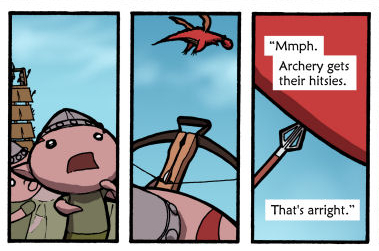 This implies that archery has some sort of bonus against flying units, and that landing on the ground would negate that bonus. This is supported by the fact that in the game Warlords III, which Erfworld draws inspiration from, all units with the archery special ability gain a +2 bonus against flying units. It's possible that all archer units have a specific specialization for the certain weapon type that they use. This page was last edited on 23 August 2016, at 03:40.